I love the Puritans, plain and simple. I first started reading the Puritans around 1980 when someone gave me Thomas Watson’s All Things For Good, a little paperback on Romans 8:28. I was hooked!! There was a time in my life, in the 80s, that I didn’t read much else besides the Puritans. I was even told by more than one person, “Bill, you were born about 400 years too late.” I took that as a compliment, though in all instances I’m not sure it was meant to be. But I still love the Puritans. 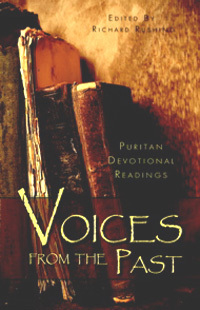 In 2009 the Banner of Truth Trust published a devotional book with excerpts from various Puritans broken up into “bite-size” daily readings. I highly recommend it as a good introduction to the Puritans.